KFC Zinger pies are back. $5 for a pie (normally $5.95) and regular chips (normally $2.95). Don't forget to add your feedback survey voucher for extra chips and drink. Seen at two SA stores, maybe national, can anyone confirm? How much for just a pie? Hoping it's NSW too. 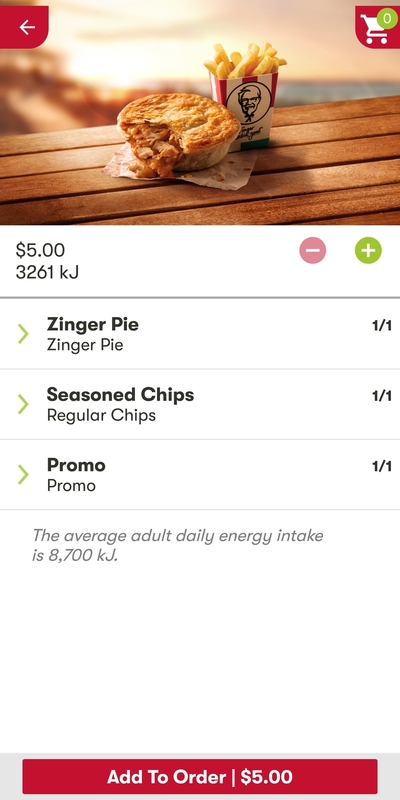 Checked the app in SA - $5.95 for just the pie. Not present in the app for NSW. $5.95 pie only menu price. Oh yeah they are always steaming. Impossible to eat at the start almost. But still good! Bring this back to QLD! Yeah…was waiting for this. Unfortunately not in NSW. Second best pies I've had in my life, sooo goood. As a big guy, I know my pies >_>, come back to the N.T please. For some reason this is hilarious to me. It is like mixing nachos with laksa or some weird monstrosity but I bet this zinger pie tastes delish. Never seen it in NSW. My one was trying to flog them off for 2 bucks for a good while at the end. Might be tripping, but I think they even sold them uncooked (like, take them home and cook 'em yourself) as well, crazy. Been long enough I forgot if I liked them or if they were just super forgettable. I'll grab one when they come back to Vic, cheers for the awareness, OP. How does this compare to a Vili's….? Facebook rep said no plans to have them in QLD, must be an SA only promotion. Boo! NSW needs this..I need this :(!